We love supporting independent restaurateurs here at Townfish, so it was a real delight to have discovered the story behind The Athenian. 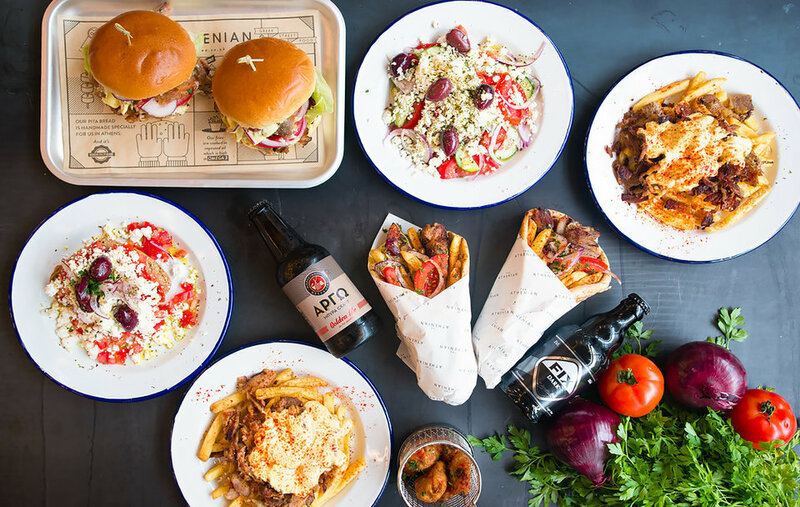 The owners, Efthymios and Neofytos started out in the tail end of 2014 as a small street food stall offering traditional, freshly made souvlakis and now fast forward to 2018, they can be found in 6 outlets in London as well as in Bristol. You might wonder what is a souvlaki? 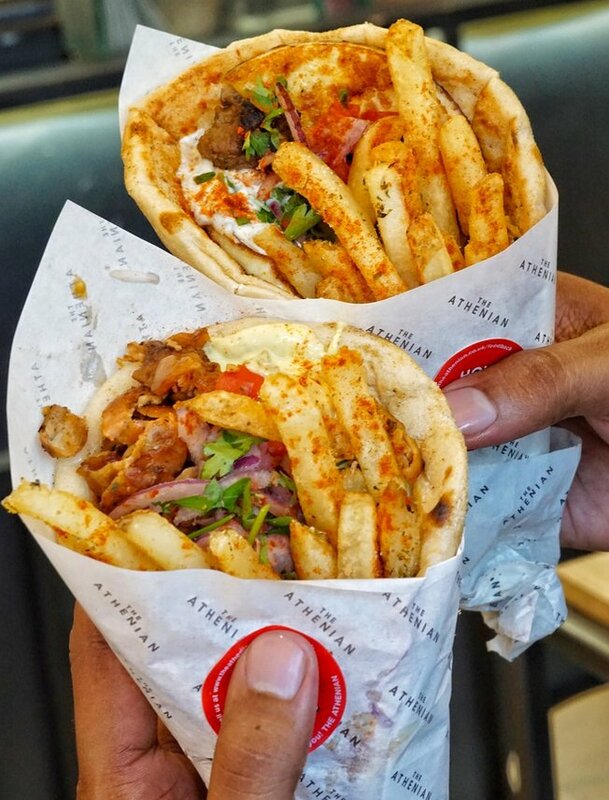 Ask any Greek and they will tell you it is the most popular street food on the go. It is generally grilled meat, cheese or mushroom wrapped in pita. The word actually means ‘little skewer’ after the way the dish is cooked. With the owners born and raised in Athens and Cyprus respectively, there can be little doubt on the authenticity of their creation. Starting at £5.50 for a regular wrap, you will be hard pushed to find a better deal elsewhere as their wraps come with freshly grilled homemade pita, salads, your choice of homemade dips and oregano fries. I chose the meaty option and picked chicken and pork skewers for the grilled meat options. The meats were incredibly juicy and tender and so well flavoured using Greek herbs and grilled freshly to order so that it isn’t overcooked, unlike most kebab shops. My constructive feedback is they should probably offer dips without the pita unless you want a double-dose of gluten but they do have some lovely sounding options like tzatziki and melitzanosalata, which is a vegan aubergine dip. 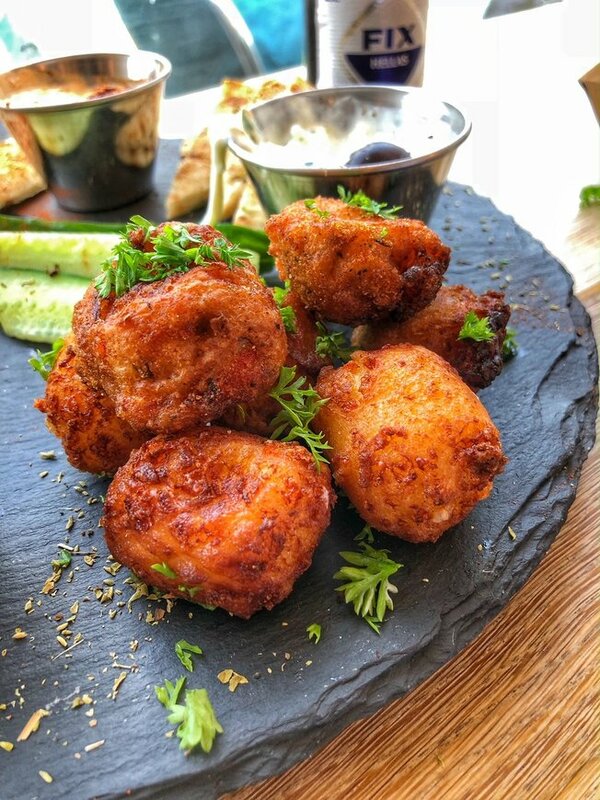 My vegetarian friend was attracted by the look of the vegan tomato croquettes; the tomatoes are from Santorini and topped up with Greek herbs. Most of their ingredients are either from Greece or locally sourced. For example, their extra virgin cold pressed olive oil is imported from Greece, the pita bread is handmade in Greece and incredibly high in fibre and their yoghurt based dips are handmade in their own kitchen using biolive yoghurt. 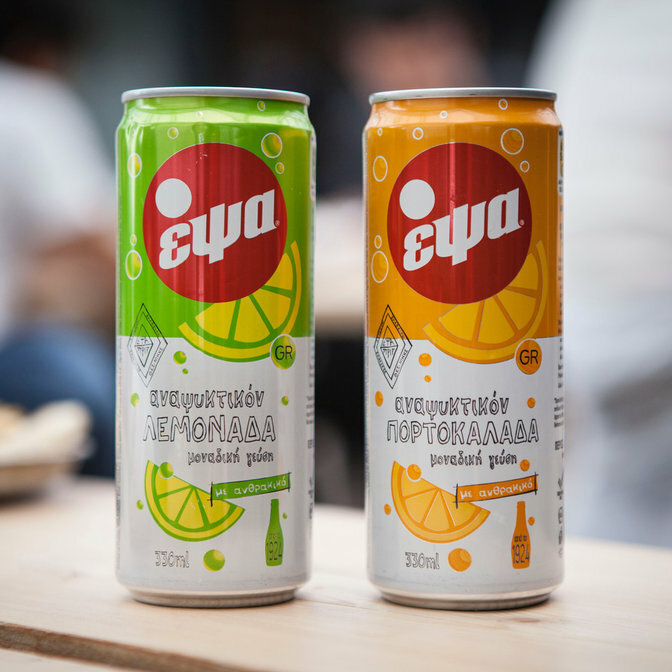 They also offer interesting low-calorie drinks using stevia direct from Greece called epsa; I tried a thirst-quenching sparkling orange version. Currently, they have branches in White City, Victoria, Tooting, Shoreditch, Elephant and Castle, and Southbank food market, so there is no reason not to check them out.